Attracting the best looking birds, ones with full luscious colors can be a bit of a challenge. It requires preparation and adding a little on the budget. Some of the considerations would be the type of birdseed suitable for specific birds, the kind of feeder you should use, the jelly flavors and ways on how to deter other predators from feasting on your feeder or worst, the birds. By preparing their right food and finding the best oriole feeder suitable for the kinds of birds you are trying to attract, then you may be able to have the best bird watching experience and enjoy the marvelous colors of orange, yellow, green and black birds all through the summer, the spring and maybe during the winter. Orioles are elusive birds. They choose their feeding stations carefully and they are known to have sweet tooth. Still, they are the most sought-after backyard birds as they come in black and orange feathers that are a beauty even from a far. Because they are elusive, bird enthusiasts do have a problem attracting them into their yard. There are solutions readily available in pet shops while some experts do create homemade feeders, which works perfectly for their feathery friends. The following oriole feeders have been tested by many bird watchers and while some did exceptionally well in attracting orioles, some are lackluster in their ability to invite the black and orange flyers. Anything that is personal is good. That is true for almost everything. 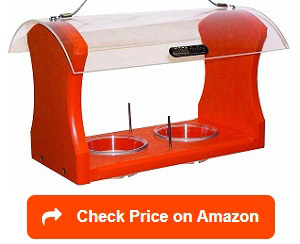 Designing your own homemade oriole feeder is an option if you want a personalized feeder. But if you do not have the time and the creativity to create one, then the First Nature 3088-32 – ounce Oriole Feeder might be a very good choice. This oriole feeder is not only handy but it is very colorful, which helps to attract your favorite songbirds. Orioles are attracted to anything that is orange in color. Unlike the regular feeder for hummingbirds, the First Nature feeder accommodates both orioles and the hummers while keeping the bees out of the way. How does this work? Most hummingbird feeders have very small ports or holes because hummers have very small bills, so most orioles, slightly bigger in size won’t be able to access the birdseeds. With the oriole feeder, both hummingbirds and orioles can feast on the birdseeds, nectar mix, jellies you prepare yet the ports are small enough to keep out the bees. The best thing bees can do is to stick their heads into the port but won’t be able to fit in at all. All bird watchers know that smaller birds such as hummingbirds and orioles are attracted to colors. 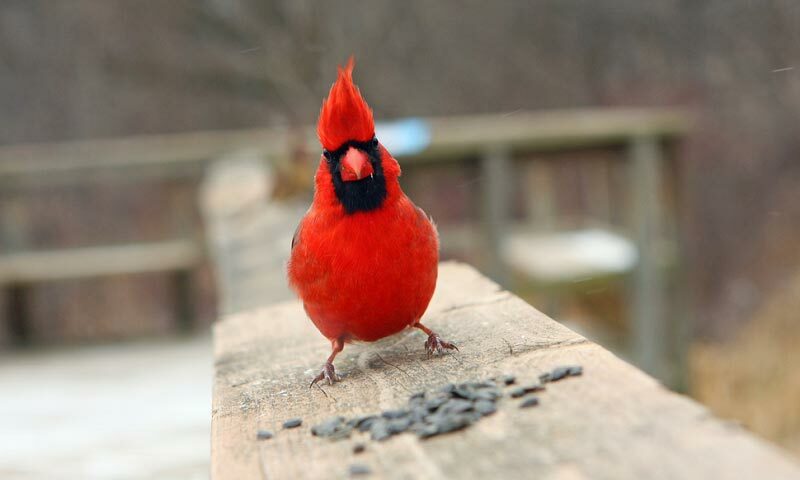 Whether it is a flower or a feeder, strong colors of red, orange, dark pink will invite more birds into your backyard. 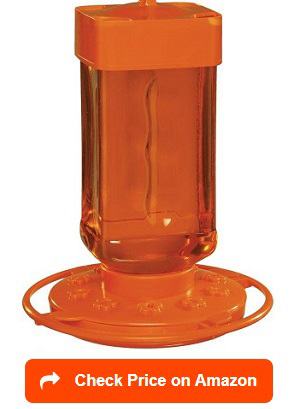 The First Nature 3088-32 – ounce Oriole Feeder is comes in full bright orange. 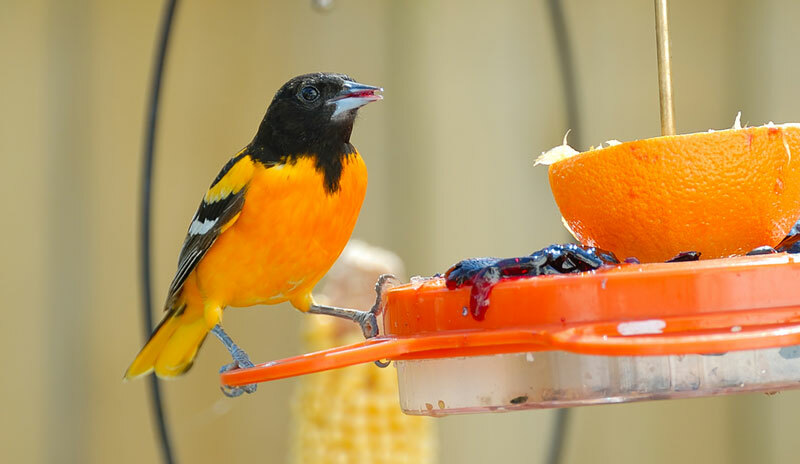 Like any homemade oriole feeder, the orange base does not only attract inquisitive orioles but it is great for keeping leakage of nectar and spillage of bird seeds, keeping ground feeding problems within your control. The product is made out of polymer synthetic plastic material making it more durable than regular plastic feeders yet priced slightly lower than feeders of the same quality. Because polymers have smooth finish, it is also easier to clean. There is probably no better time to watch the birds than when they are all trying to satiate their hunger, with fruity jellies. They always come out strong and competitive, and since there’s action, you can literally snap few photos and you’ll be surprised of the result. To be able to see them all in action, a good oriole jelly feeder that leaves plenty of room for movement is a must. If you have a tube feeder that only allows a number of birds at a time, then you might not be able to enjoy the bird feeding time. As a remedy, the Birds Choice 1009 Oriole-Fest, 12 ounce, that comes in strong orange color might be your oriole feeder option as it not only efficient but within reasonable price. Literally called the oriole-fest, this option provides your birds the chance to feast on a generous amount of nectar, oranges, and jelly, all at once. 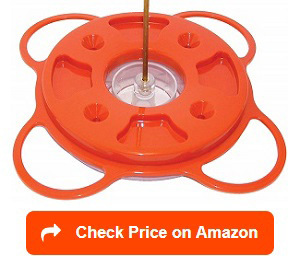 The design, a flat orange base with four feeding ports, four jelly cups, two suction cups and a spike hanging rod allows a more free movements of orioles during the feeding time. In addition to seeds and nectar compartments, the Birds Choice feeder still have room for additional treats such as cut oranges or apples. Such option provides oriole birds with more natural food to maintain a healthy body and feathers. The only problem with this oriole jelly feeder is that it has open-wide system, which means there’s a possibility of bully birds to jump on the feeder even before the orioles get the chance. Because it has flat surface, the sugar water will never be spilt on the ground. Bees are useful, at least for their honey and their ability to help pollinate flowers. But when bees swarm into your bird feeder and take over the entire thing, then you have no choice but to choose which one to feed — bees or birds? As a solution, you can simply bee proof your oriole feeder using Perky-Pet 253 Oriole Jelly Wild Bird Feeder. This simple feeder will make sure that there are no tiny bees feasting on the sweets intended for the orioles. All you need to do is twist the jar at the bottom and the jelly comes out without the need to dirty your hands. Orioles love grape jelly so there is no better way for you than to attract them using the same food and watch them hover your jellies. With the Perky-Pet, you don’t even need to worry about the freshness of the jelly because the inverted jelly jar keeps it moist and fresh. To keep bees away, dispense the jelly only when it is feeding time. Normally birds get fed every 20-30 minutes. Orioles, especially during the summer can eat at least three jars of these 32 oz jar so constantly checking it is a good idea. Summer is nesting or breeding season so they need more nutrition. The unique jelly stirrer at the bottom of the plastic tray controls the amount of jelly to be dispensed so you can really check how much food should be given. Once the jellies are out, the orioles can clean up the plate base and because there’s nothing left for the bees to devour on, they know they need to look for food elsewhere. While the Perky-Pet is an effective and efficient bird feeder, the plastic base and the plastic suffer in heat during the hot summer months. The jelly turns liquid and may run out through the holes at the bottom, wasting the precious sweet treats. 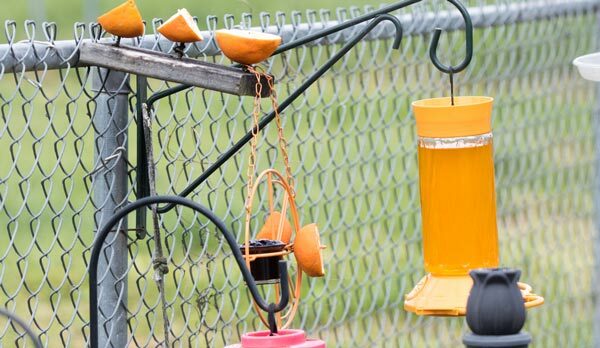 Aside from the jelly, this bee proof oriole feeder can still attract more orioles into your backyard–the Perky Pet comes in bright orange color. Yes, orioles love the color orange. The triple chain that holds the jelly plate gives more room for the birds to enjoy their food. Guarding your jellies from bees can be a little challenging. Not only bees and orioles like the same thing, they also normally come at the same time. So how can you best guard the sweets for the birds? 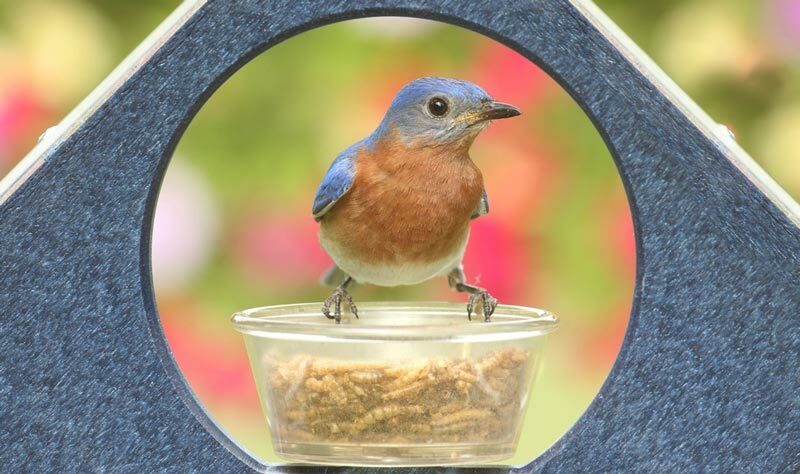 There are many ways given by bird watchers on how to best protect the feeders. Of course, one foolproof answer is to find the right oriole feeder bee guard. While it does not solve the problem entirely, it will surely lessen the number of bees coming in. Feeding the jelly in small portions. Perhaps, a good jelly feeder is all you need. 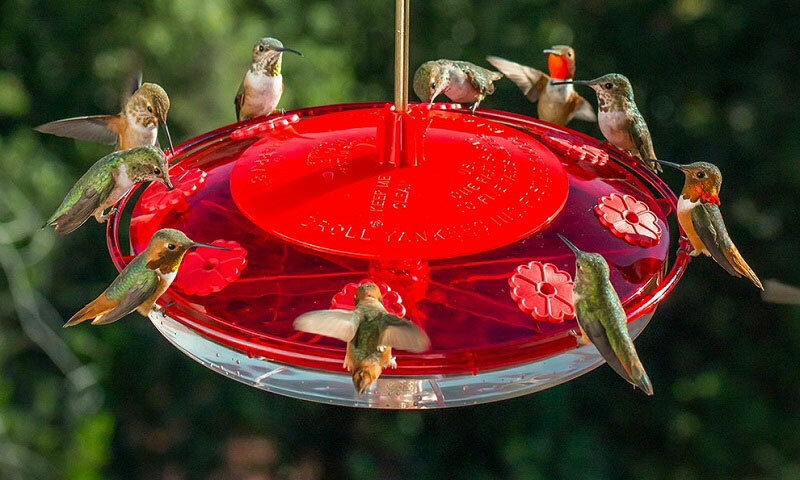 Like the Heath Outdoor Products CF-133 oriole feeder, you can have full control of how much jelly you wish to serve for the birds at one time. Consider other food. Giving orioles other types of treats can be fun. It’s not only great for their nutrition but fruits can bring in colors to your pretty feeder. Oranges and berries are good additions. The Heath Outdoor Product is specially designed to put in two halves of oranges. A perfect treat for the beautiful songbirds. Take the jelly leftover. Keeping the leftover somewhere hidden after the feeding time will also keep the bees away. Remove flowers that attract bees. The nectars from flowers attract most bees first. Having flowers around means inviting the bees to wander around until they find the feeder. This combination of jelly and orange splashes does not only provide your yard or your patio that strong orange look (and fresh smell) but also give the orioles all the space they need to feast on the sweets. The hanging chain or strings, made of coated steel, are very stylish that it will give your patio that extra garden look at a price half of most feeders. But unlike other oriole feeders with bee guard, the Heath Outdoor Product is open on all sides, you can have a perfect view of the birds feeding on your treats, which is the main reason for putting up a feeder anyway. The glass cup for jelly is detachable and easy to be brought in for washing. Perhaps, the only downside of this product would be the fact that the color of the metal changes through time, especially when it is exposed under elements, rain, sun, and wind. There are many pests that can literally kill the fun in birding. That includes pesky ants. If it is not bees, or squirrels, or other birds, the ants will surely invite themselves to share in the sweet goodies offered to orioles. This is the reason why some perky pet oriole feeders are laced with chemicals or are designed to drive those ants away. 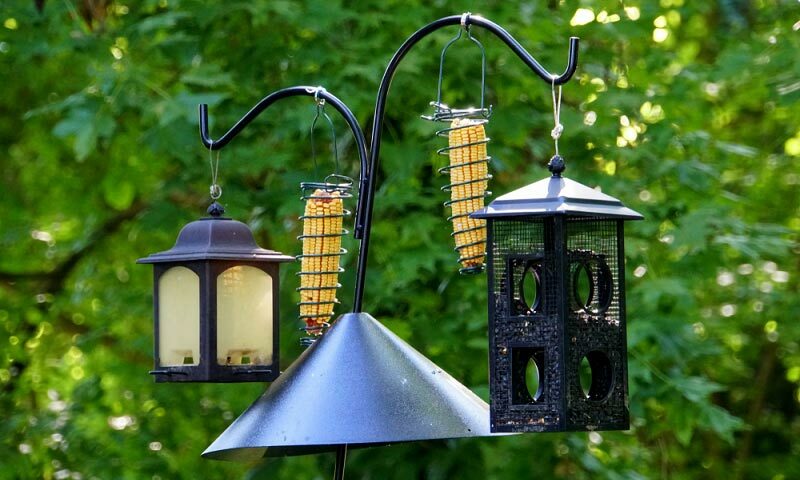 The Songbird Essentials SE905 Oriole Feeder is an example. Among the mid-range (in pricing) song bird feeders around, this product is not only designed to attract the most numbers of colorful orioles in to your yard but it is also very sleek you may consider it a decorative piece. This feeder is of perky pet oriole, aims to sate the natural sweet tooth of the orioles with a big dish to ensure there’s more jelly and oranges on offer. 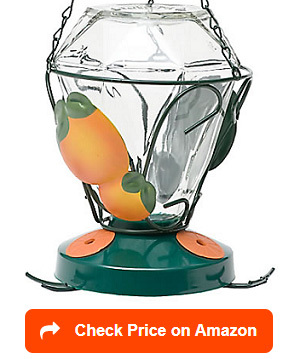 Since the price is a bit higher than many feeders, it is no surprise that the Songbird Essentials has space for jelly, oranges and nectar, a 3-in-1 combo. Because it is wide, it can accommodate more orioles feasting at the same time, choosing their menu from any of the combo. Even when the orioles come in droves, the spikes on the tray keeps the oranges intact while the liquid nectar fill the tray under the main cover. What more? The large pocket of jelly is a sure hit to the orioles. 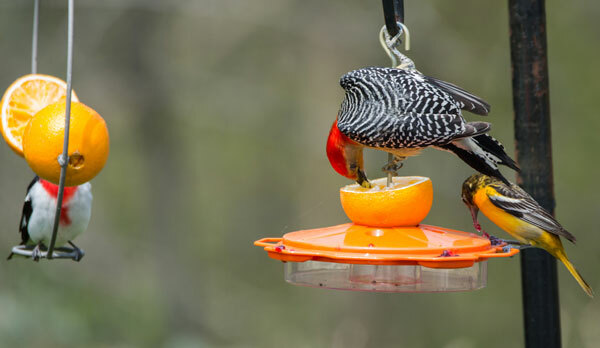 It is no surprise that they all come in this perky pet oriole feeder whenever they need their fill of sweets. Orioles love nectar so pampering them with it is a delight for a bird watcher. Having a good fliteline oriole feeder, one that allows the nectar to flow when the birds come for a feast of sweets is a necessity. Still, if you can get one that is not only useful but beautiful, then why not. The Perky-Pet Deluxe 24 oz Oriole Feeder is a must-have if you are an oriole fanatic. It is big enough to fill a 24 fl oz nectar that will be enough for few feeding sessions. Made out of glass, the nectar container or bottle lets you monitor the level of nectar, and an idea when to re-fill. Decorated in oranges, the orioles’ favorite fruit, the Perky Pet Deluxe has three feeding ports allowing enough nectar to ooze for the birds to enjoy. For ants and bees trying to steal a limelight during the feast, the Perky-Pet Deluxe feeder is the solution. The feeder’s ports are small enough for bees to steal some nectar. Ants can climb the patio but since the container is made of glass, it eventually drives ants away. 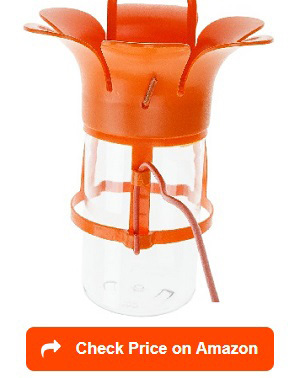 With its price, a mid-range among the choices of top feeders, this orange and green Perky Pet is a good choice especially if you are looking for ways to feed orioles and to create an illusion of light during the night when the nectar is illuminated by light. While it is undoubtedly pretty, the only downside is the fact that it is harder to clean especially with smaller holes and semi-permanent glass. Also, there’s nowhere in the feeder to put fresh oranges to the hungry feathery friends. If you wish to attract many birds at once, the Perky Pet may not be the perfect choice. Jelly feeders are fun to maintain and fun to use. Finding the right one that is sure to attract orioles is not as easy as it sounds. Orioles are known to be fickle and elusive that much effort should be given to focus on how to better attract these backyard birds into your yard. Efficiency and ease of use has to be considered. The Songbird Essentials SEBCO212 Jelly/Jam Feeder has a simple yet practical approach to bird feeding. The jelly is intact in a glass jar that fits a 10 oz, 12 oz or 14 oz jam, ready for feeding through its large orange blossom design, big enough to attract orioles. Leaving this Songbird Essentials hanging on a tree gives the birds enough space to move about as they feast on the jelly or near the window for that closer look when the birds come. The replaceable jar makes it also easier for the user to change it with grocery bought jellies. While there can be plenty of room for improvement aesthetically, the Songbird Essential’s design is good enough to attract the orioles you so desperately want to see. Priced as low ranged among bird feeders, the Songbird Essential is a must buy for beginners in the growing bird feeding society. The only downside of this product is that the bills of the orioles may not reach the jelly half way through a 14 oz jar, so a 10 oz is always advisable. They say quality comes with a price. That is probably true in this ultimate oriole feeder by Birds Choice. The Poly-Recycled Oriole Feeder SNOF is made from recycled plastic making this product perfect for wild birds. 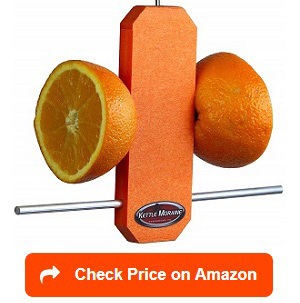 There are plenty of claims for ultimate oriole feeders but it is difficult to put real criteria on which one is truly the best. One thing is for sure, the Poly-Recycled Oriole Feeder is a great feeder with every bit of intention of becoming the best performing one so far. First, it is of very strong orange color to attract birds to keep visiting the yard, orioles specifically. Most birds respond to strong colors but songbirds love them more. With this, keeping everything in your ultra colorful feeder will surely attract more bird species and makes your bird watching experience a lot more fun. The Poly-Recycled Oriole Feeder comes with two glass cups for jelly, which can be washed easily when needed. Ideally, the feeders should be kept clean to avoid the presence of dried up saliva or other bird secretions. The clear acrylic top, which doubles as a canopy, is placed to protect the jelly from rain or snow while still keeping a clear visibility. Bird feeders should have enough space especially when orioles come in droves, possibly very hungry. The fight for food can be intense so the seize of the Poly Recycled Oriole Feeder is just perfect to accommodate as many orioles as possible. The metal rod protruding in the middle is for oranges, an additional treat to the beautiful orioles. Will the orioles come if you skip the jelly? Many experts said that while orioles are extremely addicted to jelly, it is nothing but sugar and like humans, too much sugar is bad for the birds’ health. A research indicates that natural nectar coming from flowers and bees contain 12% to 30 sugar while store bought jelly contains about half or 50% sugar. With that amount of sucrose, the birds will feel full but they get no nutritional value. The visits of the bees attracted to the nectar may also cause few other things such as bacterial growth. Any food that is sugary is very susceptible to bacterial growth. To remedy this, bee proof oriole jelly feeders are suggested. If not a bee proof one, why not just skip the jelly altogether? Sticking to the natural diet of the orioles will, of course, keep the orioles only as other flying objects; bees, wasps and other insects will have no choice but to find their own food somewhere else. The Kettle Moraine Oriole Feeder might just be the best feeder choice for this purpose. Not only is it very colorful but it is very practical as well. The bright orange plastic bar in the middle attracts the orioles to your yard while the iron rods attached to it is perfect for sticking 2 halves of oranges. To give the orioles time to enjoy their orange or fruity treats, they can perch on the aluminum rod attached to the feeder. Lastly, because there are no barriers or containers, you can have the best viewing from all angles. 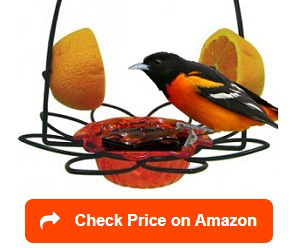 With a price way lower than most oriole feeders, this is an actual bargain. The only problem with this design is that the oranges are exposed to the elements, rain and sun, specifically causing it to either rot or dry up easily. Still, the most important things remain: it is bee proof because bees aren’t attracted to oranges. It is also safe for the orioles as it is more natural – good for their diet. There are many products claiming to be bee proof, ant proof or insects proof. Proving their effectiveness is much of a puzzle. To prove, one needs to look at all aspects of the product, the design, the size and the functionality. 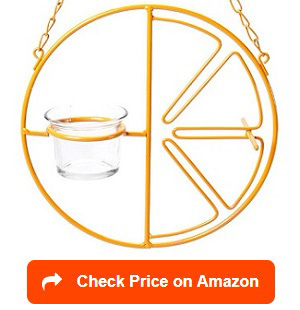 If the answer is no, a bee proof oriole jelly feeder is what you need. Proofing the feeder is made possible by looking at products that has natural components to drive bees away. If not, then you can always try more natural ways of driving bees away such as (1) Vegetable oil rubbed around the edges of the jelly cup can be a good way to keep the bees at bay as the slippery surface will be unattractive to bees or even wasps; (2) Switch to mealworms. Bees won’t dare touch mealworms. But orioles, even if they love jellies can also benefit from eating mealworms and (3) patented bee guard. Letting orioles eat in peace while keeping bees out of the feeder environment. 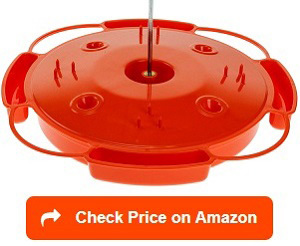 The Birds Choice Oriole Feeder Small Orange has a sleek design that works perfectly well. The birds love it and I love the flower steel petal designs as well. The petals are to be used by the orioles to perch while feeding. Yes. Orioles love to perch as much as they love jellies. You can include oranges too and let the birds have the time of their life making their sweet tooth happy. Lastly, the orange plastic cup was so thick it can hold at least 3 oz cup of jelly without a problem. Two pegs on the side allows for two halves of oranges for the orioles. Of course the pretty design adds up to the colors made by the already beautiful orioles. The orange? They love it too, and the woodpeckers that came by for a visit finished off the treats. The only obvious problem is that the design may not disappoint bees right away. The exposure of the jelly to the elements may in fact invite more bees in the long run. Still, with a little home remedy, the bees may be out of your oriole jelly feeder in no time. 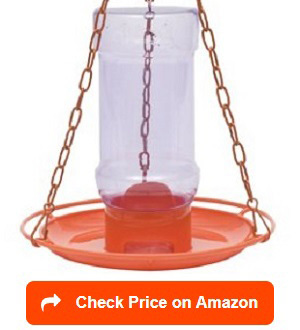 Even with its reasonably low price, putting this feeder in to your yard will surely add to your fun in bird watching. For feeders, safety of the food and accessibility of the birdseeds, mealworms or jellies is crucial. If you are trying to draw in different varieties of orioles, then it is high time to seek out good oriole feeders that are perfect for the job. They are beautiful and very effective in attracting Oriole birds to come and put beautiful contrast of colors into your backyard. Orioles are larger than hummers so their feeding station should be a little different. Unlike other feeders, oriole feeders come in bright orange to attract the birds. 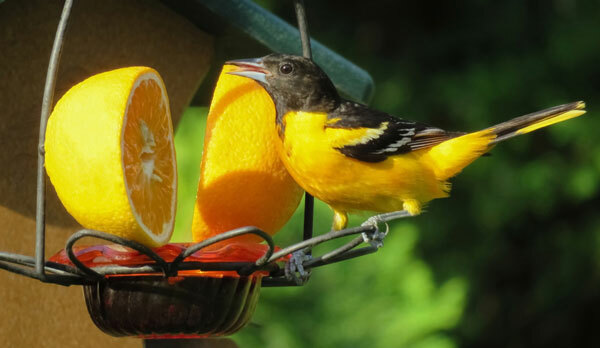 Since orioles do not just feast on birdseeds, oriole feeders has provision for oranges, jellies and nectars. There are many kinds of oriole feeders available in the pet shops, online pet shops or even ones that are custom made if you are quite the perfectionist. Before deciding which one might work best for you and the birds, you can take a quick read of what expert bird watchers say about oriole feeders. Comparing and contrasting products will allow you to give the birds the best feeding experience and yourself the best bird watching moments. Top Fill Feeders: This kind is convenient, as you do not need to worry about the contents spilling. The birds dig in and you simply refill the glass or cup from the top of the feeder. Bottom Fill Feeders: This is the traditional feeder, which features a small opening at the bottom of the nectar container. Dish: Probably the most convenient as the dish-style are easy to fill and provides more room for orioles to dine in all at the same time. Jelly: The cute little feeders that hangs a bottle of jelly for the birds to enjoy. The inverted jelly allows a controlled amount of jelly at a given time. It is very practical. The high quality oriole feeder is out there. Beginners are advised to observe the area for any other kinds of birds aside from orioles. They can be friends or foe. Changing what to feed them during the summer will also help attract more orioles into your feeders. 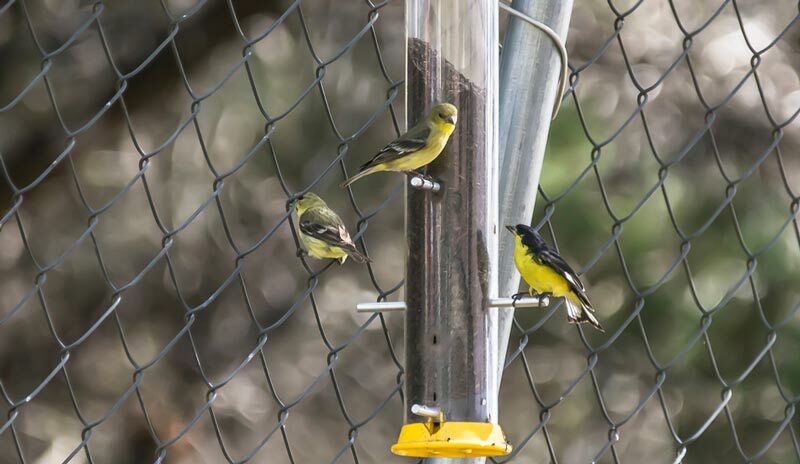 Among the many types of feeders featured in this article, you may choose ones that can be used the whole year round. Feeding Long Term vs Short Term. Some people get excited of the idea of bird migration. Think again. 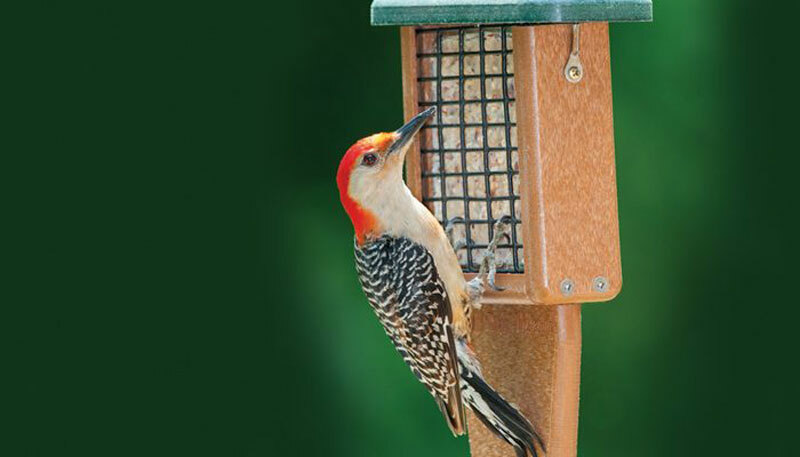 If you wish to invite birds into your yard on a regular basis, don’t settle for cheap feeders. Bird feeding is a fun hobby but it also calls for a sense of responsibility. 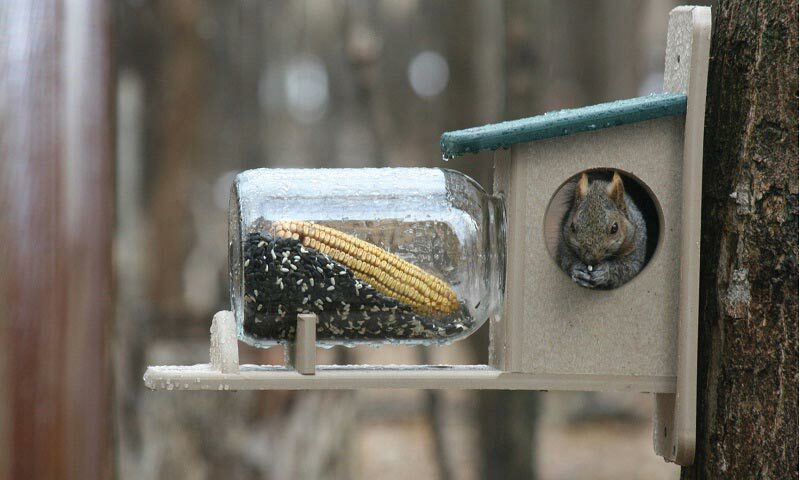 The feeder should endure the hot, the cold and the freezing weather out in the open. Think of Predators. There are plenty of enemies so be ready for them. 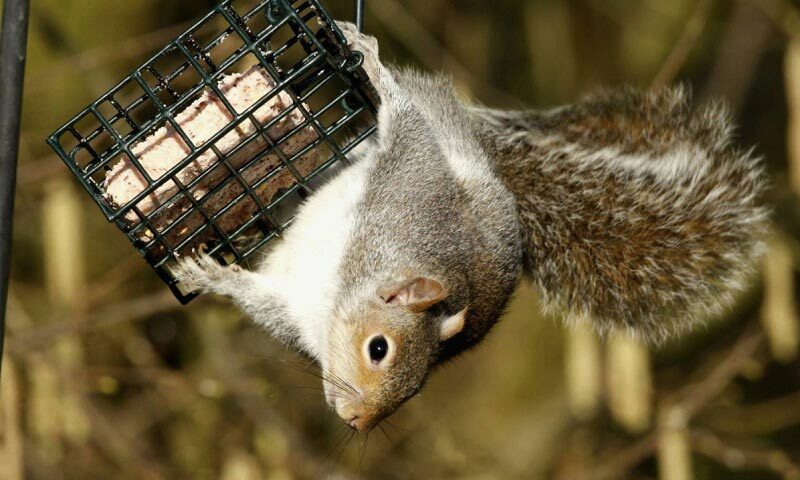 Buy feeders that are bee proof, ant proof and at all available raccoon or squirrel proof too. You’ll never know which specie is feasting on your nectar and jellies. Get ready to clean up. What is great about oriole feeders is that most of the designs being sold today are easier to clean. The dish types are even friendly to the dishwasher. But if you got one that requires cleaning up (top fill and jelly feeders) then be ready to clean or wash it up at least once a week. There’s going to be sloshing all over the feeder. Consider Size. Depending on where you are, you might have more visitors than other oriole fans in other parts of the world. If your area is frequented by orioles during the spring and summer months, get a bigger size. You do not like going out under the sun just to keep re-filling them every 2 hours or so. How to attract orioles to your feeders? Feeding orioles is easy. While they are elusive, it is easy to attract them to you a visit. For one, they are addicted to sugar: specialized nectar, jellies, and oranges are just among the top three staple food you may offer them. Having these in a beautifully decorated feeder, preferably a strong orange one will help attract a group of birds to your location. How to make oriole nectar? As mentioned, homemade things are better. It includes making your own oriole nectar. A simple nectar recipe include boiled water, mixed with granulated sugar and stirred to allow the mixture to cool. Nectar that is of room temperature is perfect for any feeder with nectar compartment. Where to place your oriole feeder? Whatever feeder you choose to put up in your backyard, experts and amateurs note that you may need to wait few days to weeks in order for the orioles to find their way to you. The truth is, even if they have seen your feeder, they may not come right away. These beautiful flyers are so picky they will round your area few times before they decide to get a taste. But once they are in, then you can take some rest and enjoy watching. When to put your oriole feeder out? The most important thing is for them to spot your feeder and its sweet goodness during the start of the spring. Once the orioles miss out your feeder during this time (around April), they might stay away for good. If you noticed, all birds come almost at the same time each year. Choosing the proper feeder and putting several feeders for different kinds of birds will help you out big time. Other birds that might also feed on the same thing (jelly and oranges) will fight for the oriole feeder so having different feeder especially for them is ideal. Where to place oriole feeders? Putting feeders for hummers and orioles separately will provide your orioles peace when feeding. The same is true for all other bird species. Depending on how many species of birds visit your yard each migration season, then you can choose to accommodate each or find a way to get rid of some. Putting them into the patio or in the middle of your yard, with enough distance from other feeders will be ideal. How to keep bees away from oriole feeders? Bird experts would have a million and one ways of keeping birds away. Two that tops the list include (a) buying a bee proof oriole feeder (see some of the products above) and (b) putting chemicals such as vegetable oil or Vaseline to be rubbed around the edges or openings of jelly jars. Once you have gotten used to the idea of bird feeding, you will be able to spot the best oriole feeders without a problem. This is also true for the food they need during a particular season. Fruits and jellies during the spring, the time of migration is great as they need the energy boost to sustain their travels. On summer, the nesting season begins so their diet has to change as well. Insects provide them more protein and other nutritional value they need during the nesting time. The jelly jars or cups can be filled with mealworms during the summer. Also, keeping a source of water at bay will keep your orioles nearby. They are attracted to play in shallow baths and running water. Splashes normally invite more orioles to join in. 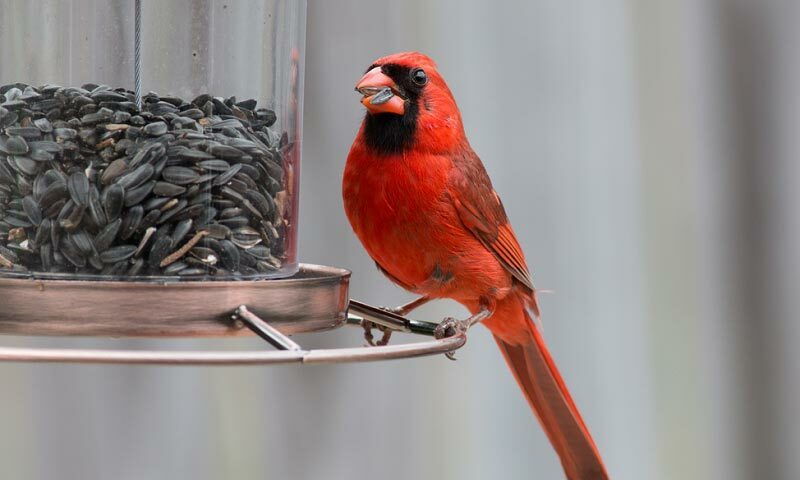 Keeping them fed, energized and happy during the spring and the summer means that you might have migratory birds that come and visit your yard every birding season.